One Sip, and Wooh! @champagnepapi @nikimurphy @therealdennisg . Going live today. Last year, Drake launched a line of whiskey called Virginia Black. As expected, Drake stars in the latest advertisement for the brand which features his hit single "Passionfruit" off More Life. During the commercial, Drake sips on a glass of whiskey alone at a bar while carefully making his way toward a woman of interest. As it turns out, she's had her eye on someone else the entire time—Drake's father, Dennis Graham. 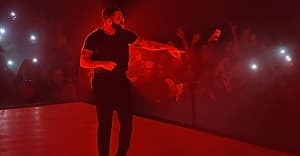 Earlier this summer, Drake randomly posted a few short ads for Virginia Black on Instagram that featured Dennis along with his signature catch phrase "One Sip, and Wooh!" In a recent cover story for The Hollywood Reporter, Drake formally announced his return to film and television. Watch all the family drama unfold in the commercial, above. Revisit The FADER's interview with Dennis Graham about the most valuable things that he's learned from Drake.